Brad Thorn enjoys a lighter moment at training. 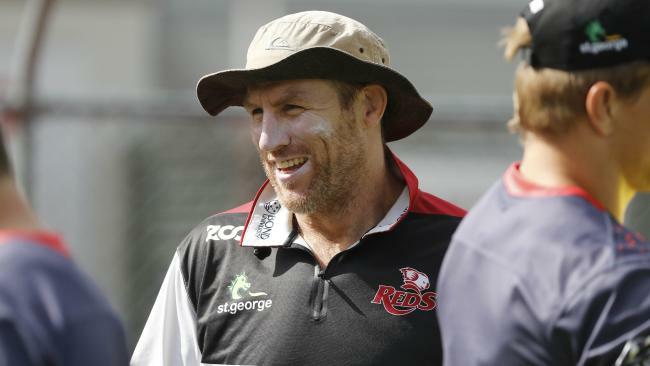 BRAD Thorn stories never get old and the current generation of Reds players are revelling in the opportunity to tap into their famous coach's wealth of experience and knowledge. 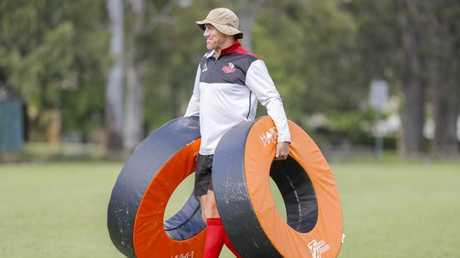 That applies to even the old hands at Ballymore such as in form lock Kane Douglas, set to play his 100th Super Rugby game against the Sunwolves in Tokyo on Saturday. Douglas this week reflected on that achievement and shed a little light on Thorn, the 43-year-old former rugby and league champion who has impressed in his first season of Super Rugby head coaching. "He's done everything but he's very confident and proud of all his achievements too," said Douglas, the 28-year-old who will join Bordeaux at the end of the season. 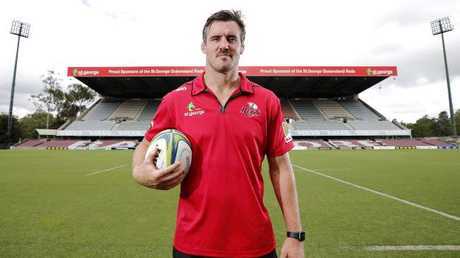 Reds lock Kane Douglas will bring up his 100th game this weekend. "I suppose some people might take him the wrong way and feel like he's skiting about what he's done but everyone listens to him, he has done everything, he's won every trophy. "And he goes 'my body would be bloody full if I got all my tattoos'!" The Reds sit third on the Australian conference standings with a 4-5 record, already matching last season's win total under Nick Stiles (4-11). Coach Brad Thorn in action during a training session with the Reds. Douglas said he had already learnt plenty from the 2011 World Cup winning All Black, who played competitive rugby as recently as 2016 with Queensland Country. "He's only fresh out of the game, he's got that New Zealand approach of just working on your skills over and over again. "We didn't do much boring running in the preseason, it was all games and even when we did forwards stuff, we'd go from lineouts to kickoff stuff and he'd even be in the middle of the field doing crossfield kicks to the props. 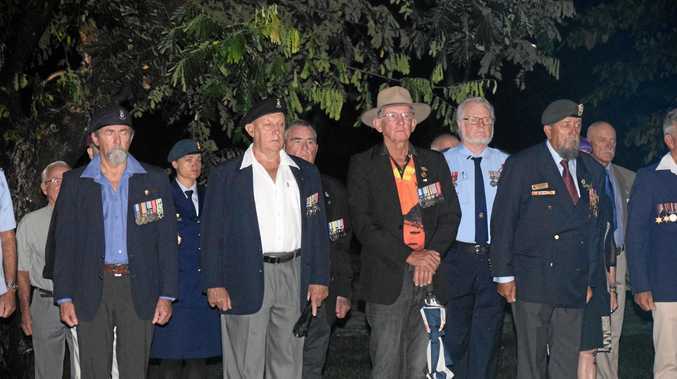 "There'd be second rowers practising high ball catching and stuff that we didn't normally do in the past, just skills. "And everyone stops and listens to him because he has had an awesome career and you want to know from his experience, you want to learn. "So he's great to have around."